This is for the Mobile or Base Model Radios that have the Amplifier built in. There are 2 ways that this can be done. This would consist of adding a single throw switch in-line with the 8vdc source feeding the Amplifier Relay. This disables the Amplifier and will let the radio key about 1-2 watts AM RMS, 8-12 watts SSB PEP for most radios that have a single final transistor for a pre driver to the Amplifier. With the Amplifier in the Off position the Meter on the Radio will NOT read properly and in most cases the Meter will peg the needle on Key-up. This is the cheap decision, but will work for most customers applications. I add a 4 pole switch and 3 mini variable resistor. This will give full control when the Amplifier is Off. I can then reset the Hi/Low RF Output Levels along with a secondary meter adjustment control. 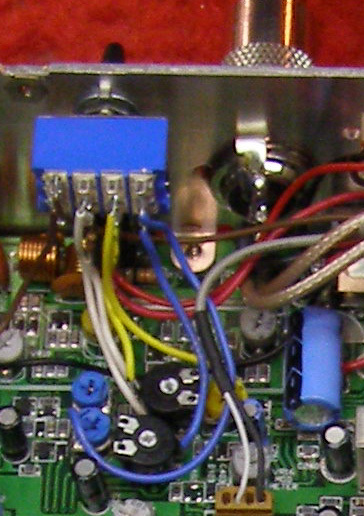 The Low and Hi Levels are usually 1-5 watts Am RMS and 14-22 SSB PEP for a single final transistor pre-driver section. The dual final pre-driver model radios will transmit 3-12 watts AM RMS and 22-40 watts SSB PEP. $30.00 Installed. See Picture below.